Sociabble is co-sponsoring this year’s Corporate Social Media Summit, which takes place on June 20th and 21st in New York. Throughout the event the team will be giving live demos of the Sociabble employee advocacy platform; while attendees will also have the opportunity to hear Marylin Montoya, Director of Marketing and Partnerships, discuss the role employee advocacy plays in digital transformation. Audience members will additionally see a case study on Microsoft’s global deployment of the Sociabble platform. 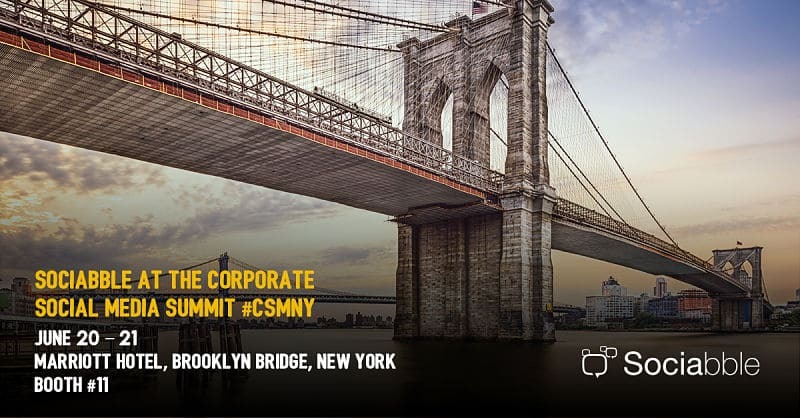 Now in its 7th year, the Corporate Social Media Summit brings together some of the world’s biggest brands and leading social media professionals; offering a unique combination of industry expertise and company-specific case studies. At the Corporate Social Media Summit Marylin Montoya will explain why employee advocacy is key to companies becoming truly social. Attendees will also have the chance to see how Microsoft has empowered employees as brand ambassadors on a global scale. The Sociabble employee advocacy platform aggregates company and third party content and empowers employees as ambassadors by allowing them to share on their own social networks. This sharing activity also amplifies the visibility of content on social networks; while the platform can be tailored to boost marketing, social selling and social recruitment activity. Sociabble integrates with enterprise tools such as Salesforce, Office 365, Yammer and Chatter; and is available as a native app for Android, iOS and Windows Phone. Attendees at the Corporate Social Media Summit will have the opportunity to see Sociabble in action, meet the team, and also find out more about how we work with companies to transform digital strategy and empower employees on social media. Interested in employee advocacy but can’t make it to the event? Contact us. What Next for Social Business? Want a taster of what to expect from Sociabble at the Corporate Social Media Summit? Watch this preview of our keynote session from CeBIT 2016, and access the full version here.